Entertainment Earth unveiled a Dexter SDCC exclusive: "Get ready for our "Final Season" Convention Exclusive! 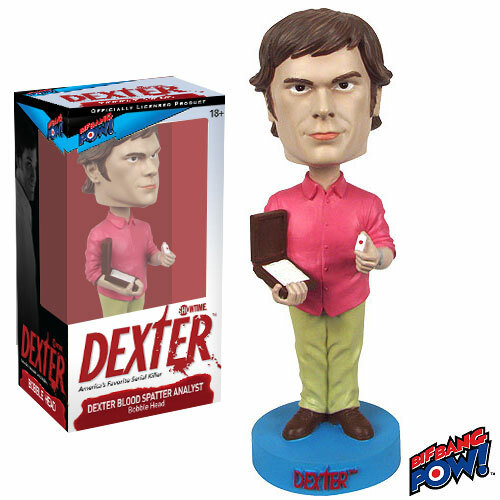 - probably our last Dexter Bobble Head in our Dexter product line. Your favorite blood-spatter expert / serial killer can bobble. Dexter Bobble Head from Showtime's hit series. He's on the job, holding a blood slide and slide box. On the job in his pink shirt and holding a blood slide and slide box, your favorite blood-spatter expert / serial killer from Showtime's hit series Dexter is here to bobble in this remarkable 7-inch resin bobble head from Bif Bang Pow!. NOTE: This item will first be sold at San Diego Comic-Con 2013 at the Entertainment Earth booth #2343. If supplies remain, your order will be filled and shipped to you after the event, during the last week of July 2013."